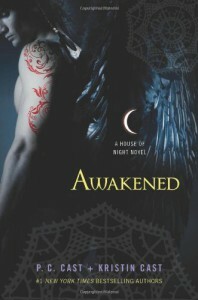 Awakened (House of Night, #8) - P.C. and Kristin Cast - So many books, such little time. '"Zoey lives." Neferet's voice was flat, cold, lifeless. "Then you owe me the subservience of your immortal soul." She started to walk away from him, toward the rooftop exit. "Where are you going? What will happen next?" Disgusted by what she perceived as weakness in his voice, Neferet turned to him. She drew herself up tall and proud, and held out her arms so that the sticky threads that pulsed around her brush her skin freely, caressingly. I liked that every chapter follows different characters still. Towards the end we visit unexpected characters such as Heath in Nyx's grove and also Linda Heffer, Zoey's mother, for a very short chapter.